You know the cover by heart. The colors of their suits unfold from left to right in the only way they could; bright yellow, piercing pink, neon blue, to tangerine crimson—a picture perfect display of regalia, their names spelled out in flowers. The surrounding crowd, collaged and tightly pressed around them, pieced together portrait after portrait, feature their past selves, celebrities, caricatures, musicians, familiar and lesser known figures alike. The sky is blue, and the kick drum in the center of the composition holds the name of this unlikely assembly. This is the image of Sgt. Pepper’s Lonely Hearts Club Band. It represents one of the only true instances of “once-ness” in mid-century popular cultural production. The year was 1967; The Beatles’ album release marked one of the first occurrences of synchronicity across international markets. The globalized dissemination of culture would not become expected until much later. There are two essential interpretations of the term “Pop;” the first, of course, is an abbreviation of popular—still widely used today—and the second is onomatopoeic, Pop!—the sound of immediacy, everywhere and all at once. The prevalent history of Pop Art was emphatically Western—belonging to a British genealogy, where it was said to have emerged in the mid-1950s. The ubiquity of the movement was followed soon after by its rise in the United States, where it thrived throughout the following decade. This is the history we know. As stated in the introduction of Pop Art, Taschen’s original title on the movement, “Pop is entirely a Western cultural phenomenon, born under capitalist, technological conditions in an industrial society.” While the commercialism and market-based interests of Pop is, in many ways, a true telling of the movement’s catalysts, the beginning could not be further from the truth. Pop’s history has so far been associated with its popularity—with Richard Hamilton, Roy Lichtenstein, and Andy Warhol, among others in the cannon—but its presence is truer to the sound it triggers. Pop was everywhere; you just did not see it. A series of exhibitions that opened over the past year—International Pop at the Walker Art Center in Minneapolis, The World Goes Pop at the Tate Modern in London, and Pop Art Design at the Museum of Contemporary Art Chicago—point toward a resurgence in a contemporary fascination with Pop production in a global way. In these exhibitions, International Pop was defined by what it was not. It was not American or British, but contended with consumer culture in its own, nationalistic way. While Taschen’s 1990 publication credits a minor Western European existence of Pop, and even smaller Eastern European influence—“artists in the communist countries of Eastern Europe have only picked up the sparks and residual traces of this movement”—with the exception of Japan, which was occupied by the US for years after WWII, Pop’s market and consumer-based interests were said to not exist under communism, and other political contexts. 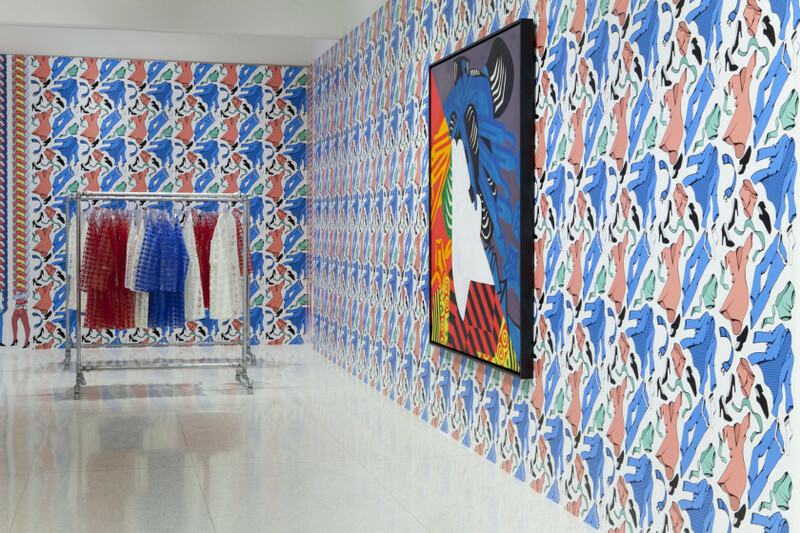 Installation view, Pop Art Design, MCA Chicago, December 19, 2015–March 27, 2016. Photo: Nathan Keay, © MCA Chicago. It deserves attention that these leading institutions would, in the twenty-first century, try to correct the inaccuracy. Whether in an attempt to un-whitewash the history of Pop, or capitalize on an underrepresented market as an impetus to grow the collection, the proliferation of exhibitions in 2015–16 was not simply a staged repetition of work from these institutions’ existing inventory. In the case of these shows, this trend unfolded in three unrelated occurrences, pointing toward a much-needed second look at the global generation of Pop. From Argentina to Brazil, Columbia to Croatia, Hungary, Iceland, Israel, Japan, Peru, Poland, and beyond—these shows made a concerted step forward to expand the field of what major institutions credit as influential to the movement. We start with Sgt. Pepper’s. While transnational communication was not a mid-century custom, The Beatles tested the boundaries of what was possible. Consumer culture may have been branded as American, but what Pop did was devise an aesthetic attitude that mimicked graphic techniques, flattened, simplified, and cut away—mass media, desire, culture: none of these things have one single hegemonic definition by nature. I am reminded of Hans Belting’s notion of a “polyphonic art history.” I am compelled by the idea that the story we know is not the only story there is; but is rather one of multiple iterations, which can exist independently from, or in relation to, the dominant narrative. This theory holds promise for a few reasons. The first being that, perhaps, the biggest caution for a reviewer writing about these three exhibitions—at the Tate and Walker primarily, but also at the MCA—is to draw comparisons that unite everything else in contrast to American and Western motives. That being said—there are a few significant tropes traced in the approach of this dispersed, decentralized Pop that arose out of each exhibition. The first, and most evident, was a palpable difference between the singular and the plural. The texture of the International Pop image was built on the multiple: not only as production, but also as subject. In place of Warhol’s Marilyn Monroe, or the single pop icon (Elvis, Jackie Kennedy, Elizabeth Taylor, etc. ), which was reproduced again and again until the image was degraded, and visibly broken down against the screen in succession, much of the international Pop that was on view in these exhibitions was inherently more politicized. Its subjects included the proletariat, the crowd, fleeing masses, or packs of troops. This plurality was concentrated across all three exhibitions, whether in the exuberant painting collages of Erró (b. 1932, Iceland), which chronicled consumer culture pressed up against global politics in a signature cartoon style; Keiichi Tanaami’s comic strip like canvases (b. 1936, Japan), whose tightly-packed and hyper colorful compositions critically illustrated the impact of American culture in foreign nations; or Beatriz González’s (b. 1938, Colombia) radical paint-by-numbers-esque configurations that denounced the fetishization of Western art history, taking the cheap reproductions of Classical Art that were prevalent in circulation as a source to critique Colombia’s Eurocentric gaze. Beyond the work included at the Tate and Walker, the plurality of context—both intended and incidental—is a product of Pop’s multiplied visual field in the everyday environment, where consumer culture thrived. Pop Art Design at the MCA, curated by Michael Darling in collaboration with the Vitra Design Museum in Germany, traces this landscape with supreme agility, foregrounded through an emphasis on the functional and atmospheric facets of the movement. We start also with 1967 as an important chronological marker; the USSR and its satellite states celebrated the fiftieth anniversary of the Russian Revolution, and China’s Cultural Revolution gained momentum. In Erró’s 1968 painting, American Interior No 1, which was on view at the Tate, a red army of Maoist troops is pictured in the window, threatening to invade the home’s peaceful pastel midcentury décor. The contrasting tableau of soldiers, lifted from a catalogue he bought in Paris, marked just one of the many early instances of his appropriation of international propaganda. In Lovescape (1973–74), included in Galerie Perrotin’s exhibition ERRÓ: Paintings 1959–2016 in New York, voluptuous female-like figures with animal heads, or bodies, make love to bombs, automobiles, rockets, locomotives, and missiles. In a sort of Hieronymus Bosch-like composition, set against the expansive backdrop of snow-capped mountains in first perspective, the sixty-nine couples each perform the 69 position. This is love in the age of machinery. The exotic animals—elephants, tigers, baboons, etc.—are illustrated in poster-like style, heavily outlined and graphic, evoking the affect of a nationalized erotica of technology and progress. For Erró, as in other international Pop artists, the flatness of the picture plane was born out of depth in pattern, not in surface. In Equipo Crónica’s (b. 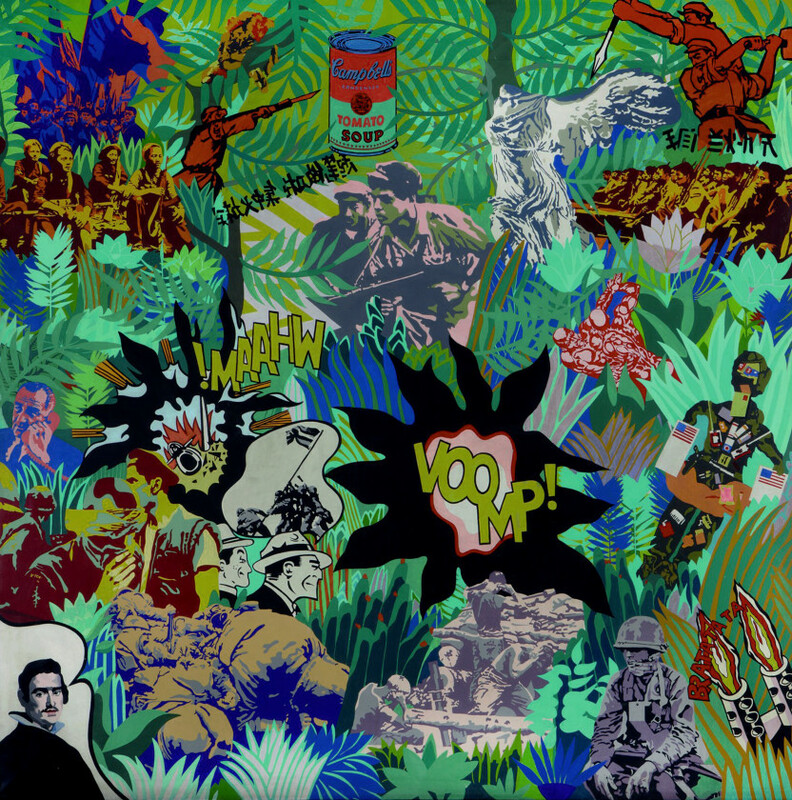 1940, Spain) Socialist Realism and Pop Art in the Battlefield (1969) also included at the Tate, the tropical iconography that occupies the majority of the canvas is captured within a thought bubble. Originating from a small portrait of El Greco in the lower left corner of the painting, Warhol’s soup cans jut up against reductive poster-like imprints of revolutionary Maoist workers, comic styled sounds of explosions—such as VOOMP and WHAAM!—are placed against more simplified Japanese text characters, and lotus blossoms. Stemming from Crónica’s larger practice, which questioned the “golden era” of Spanish identity, Socialist Realism and Pop Art in the Battlefield pictured, within a single plane, the debate over figuration in painting during the Cold War—between the political aesthetic of the Eastern Bloc and the commercial iconography of American Pop. The plural subject of International Pop was not limited to what was portrayed on the canvas. Behind the Iron Curtain, progressive artists such as László Lakner (b. 1936, Hungary) did not examine consumer society so much as the “condition humaine of a soft dictatorship,” in exhibitions reluctantly permitted by officials. As far as global perception was concerned, where the West was defined by abundance, the East was characterized by shortage. 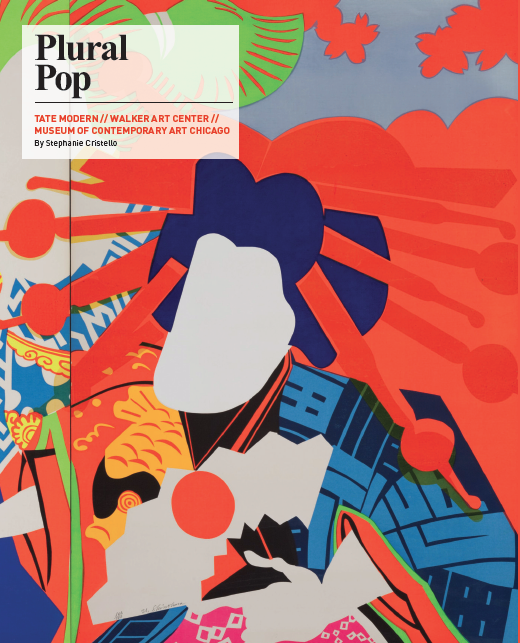 But for Pop, a movement predicated on appropriation, there was no shortage of materials—while standing in for popular, Pop can also be interpreted populist, and as such, could be developed in relative isolation from Western interests. In Lakner’s Rembrant Studies series (1966), included at the Walker, the work could be seen as a counterpart to Rauschenberg—not only in terms of their montage-like composition, but in relation to his appropriation of Classical Art. Unlike Rauschenberg, even the most collage-like elements of Lakner’s paintings were reproduced by hand. Their effect, photographic and disjointed, broke the picture plane in a similar way, depicting flatness in space through fragments. The palette of Lakner’s work was pale in comparison to the high key tones of American Pop, which like Gonzalez’s paintings, was born out of the nature of the source material: poorly reproduced images of sparsely available Western influences. Equipo Crónica, (b. 1940, Spain), Socialist Realism and Pop Art in the Battlefield (1969). Image courtesy of the Tate Modern, 2015. Japanese Pop was perhaps the only exception to these variations of ‘unavailability’ that characterized the Eastern iterations of Pop on view across all exhibitions—venturing instead toward an almost hyper-American excess. Of course, there are differences between these contexts, namely the influx of Western-dominated culture as a result of the seven year American Occupation after WWII. Ushio Shinohara’s Doll Festival (1966) recalls Ukiyo-e, woodblock prints from the seventeenth to nineteenth centuries, in a contemporary composition—a three paneled painting that features a congregation of five figures, their outfits a mismatched blend of traditional and Western styles. The fluorescent swaths of orange across the screen-like composition provides a contemporary material complement to the more earthy elements of the palette. In various Oiran paintings, a female archetype of old Japan, one of which was included at the Walker, Shinohara provides a more precise counterpart to Warhol’s Marilyn. Whereas in Warhol, the bright light of cinema paired with the reductive quality of silkscreen reproductions washed away nearly every detail of the cinematic portrait—the graphic suggestion of eyes, nose, and mouth the only features remaining—Shinohara accentuated the concept of this blank face through omission. His Oirans are pure white, faceless. They are almost more American then any other Western Pop artist because of this. In thinking about this “anti-environment,” beginning with what International Pop is not can actually be productive and generative to its history. As the Walker, Tate, and MCA attempt to cement in Pop’s surrounding ideology, this polyphonic presence is led through institutional efforts. While nearly fifty years later, that these works by international artists would enter the collection now, in an age where previously unknown artists can be globally accessed, researched, and included into future narratives, is no small feat. To have these exhibitions enter the disseminated, global context of art history now is anachronistic in the best way possible. Plural Pop is contemporary, and has a renewed institutional relevance, now more than ever. Osterwold, Tilman. Pop Art. Köln: Taschen, 1990. Print. Belting, Hans. Art History after Modernism. Chicago: University of Chicago Press, 2003. Print. Alexander, M. Darsie, and Bartholomew Ryan. International Pop. Minneapolis: Walker Art Center, 2015. Print. April 21, 2016 | Filed under Art Seen: Chicago, Art Seen: International, Art Seen: National and tagged with Equipo Cronica, Museum of Contemporary Art (MCA) Chicago, Stephanie Cristello, Tate Modern, The Walker Art Center, Ushio Shinohara.